Hope you all had a fab weekend. 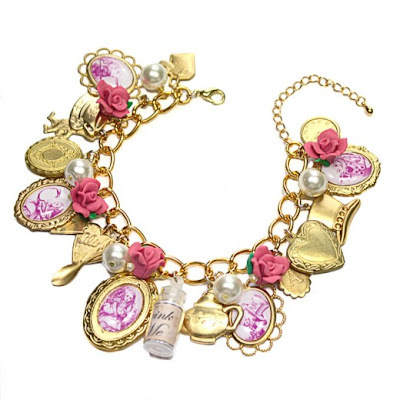 Just a quick blog to let you know that I have added this delightful Alice in Wonderland – Pink Edition charm bracelet to my website. The bracelet is now made to order and can be found along with my other Alice in Wonderland jewellery designs. The bracelet is a wonderful, fun edition to my Alice in Wonderland jewellery range. This gorgeous Alice in Wonderland charm bracelet depicts lots of magnificent elements from the Alice in Wonderland story. Attached to the gold plated chain is a teacup, teapot, top hat, drink me bottle, clock charm, White Rabbit charm, Mad Hatter charm and lots lots more! There is a rather striking contrast between the gold and the pink on this jewellery design. Certainly a must for any Alice in Wonderland collector!